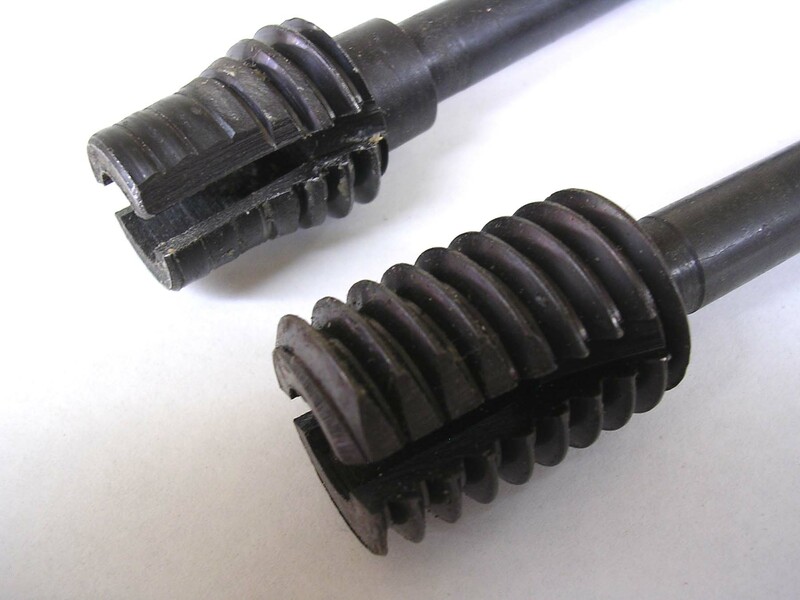 This is the 1"-6TPI thread box set and the tools you will need to properly adjust it. 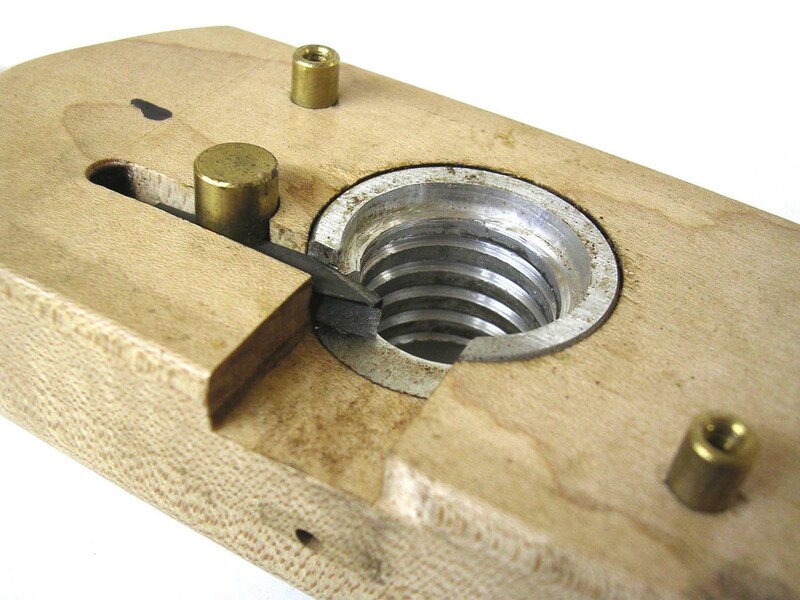 In a recent article about the Beall wood threading system I mentioned that I had previously been working with a modern thread box set to cut male and female threads in wood. I think this system merit’s a closer look as it is a very good way to cut threads in wood inexpensively. 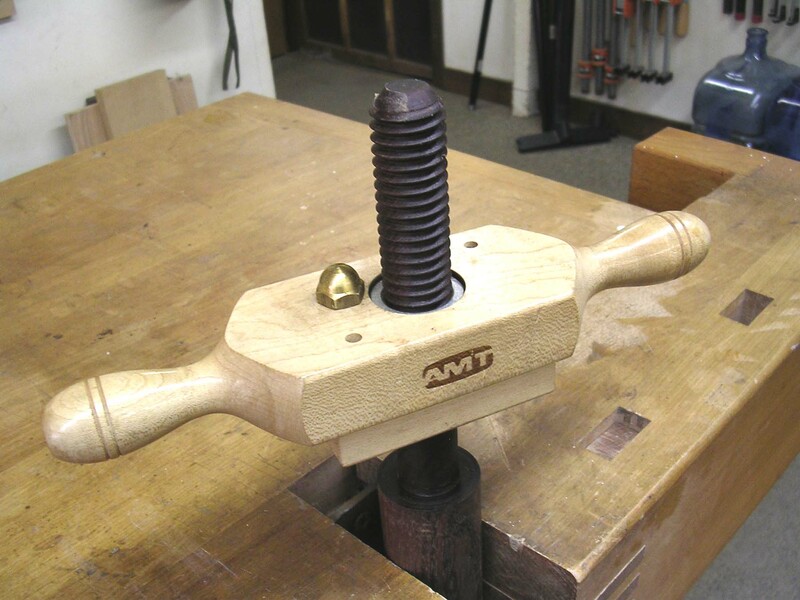 The opening picture shows the 1” AMT thread box set that I use to make threads for the “Mini Moxon” twin screw vises that I make. This set, along with several others was purchased at an auction many years ago and sat on a shelf until recently. 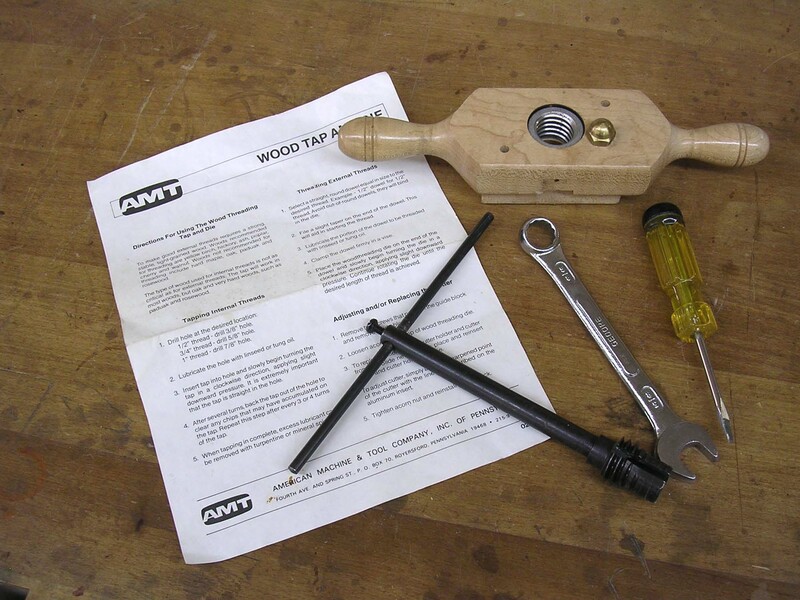 AMT is not in business anymore, but these thread box sets are still being made and sold by many woodworking tool suppliers and they come in sizes up to 1 1/2″. I looked at one in my local Woodcraft Store and it appears to be about the same as my set. The set includes the thread box made of maple I think, the taper tap and handle and instructions. As shown you will also need a small screwdriver to remove the guide block from the thread box and a wrench to loosen the thread box cutter for adjustment. Here you can see the tap in use on red oak. I recommend cutting the internal threads first. Then you can adjust your thread box to cut an external thread that fits your internal threads properly. 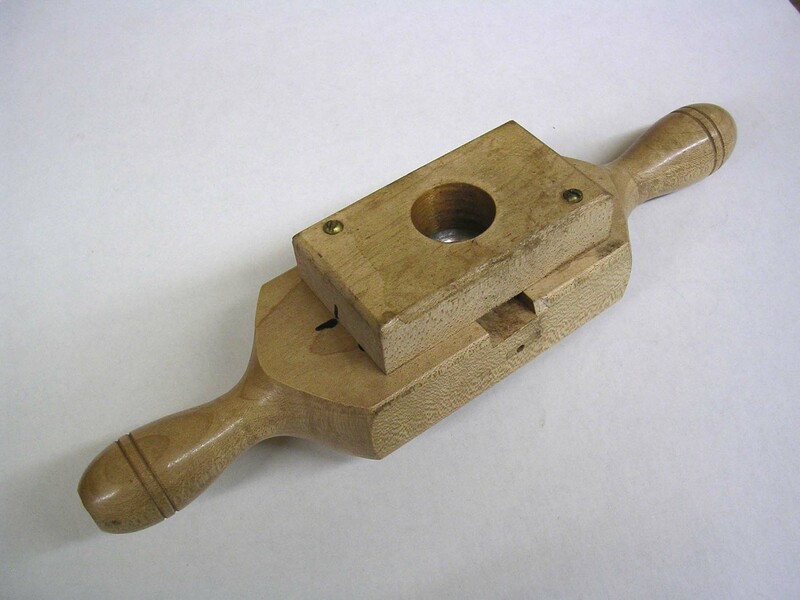 Most large taps for wood are designed to be used with a drilled hole 1/8” smaller than the large diameter of the tap. I used a 1” tap so I drilled a 7/8” hole. This hole, for most uses, needs to be perpendicular to the face of the wood it is drilled into. I recommend using a drill press for this operation. Care must be taken starting the tap. You must get it started straight. The taps have a straight diameter about the size of the drilled hole and taper up to full size. This helps you to start the tap straight and to get it cutting straight. Use a couple of squares set 90 degrees apart and sight your tap parallel to these if you need to. Once you get the tap started it will tend to follow the hole. Be prepared to use some muscle. It takes a lot of power to turn a large tap into hardwood. On the red oak shown I used a couple of 10” long pipes on either side of the tap handle for some extra leverage. In this picture you see the taper tap that comes with the set and the optional bottom tap. The tap that comes with the thread box set, (the top tap in the picture above) is designed for tapping through holes only. There is a special tap (the bottom tap in the picture above) that is designed to tap blind holes. I have not found that lubricating the tap helps ease the force necessary to tap a hole or improves the finished thread in any way. However, if you wish to use a lubricant I think mineral oil would be best. This oil won’t get gummy, as linseed oil might. The thread box in use cutting a walnut screw. This picture shows the inside of the thread box looking from the bottom through the guide block. If the tool begins to bind and turn very hard stop and turn it counter clockwise to remove it from the work. It needs to be adjusted. In the above picture the guide block has been removed so you can see inside the thread box. You can see the cutter coming in from the right. Below the cutter you can see a threaded aluminum bushing. 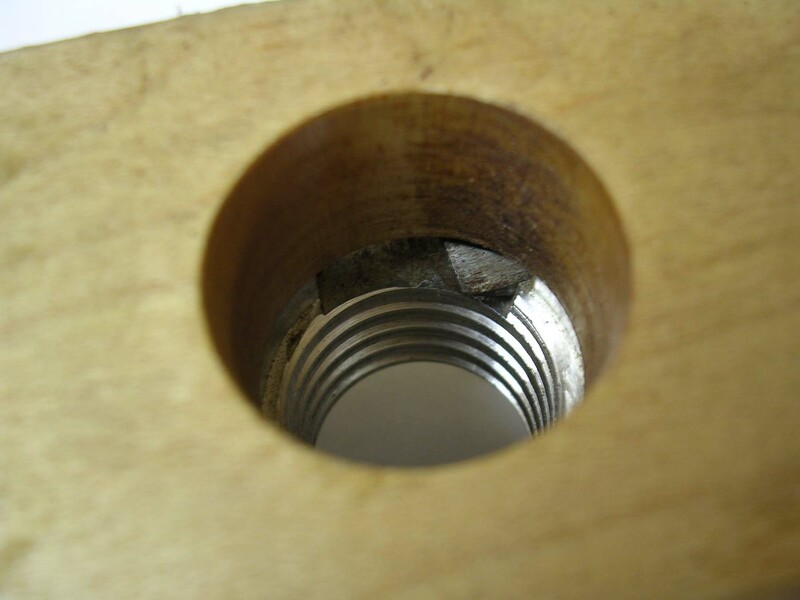 When the first cut thread enters this threaded bushing the bushing’s internal threads engage with it driving the tool down so it can continue to cut the threads. If the cutter is not cutting deep enough the cut thread is to big to fit into the bushing causing the tool to bind up. Here you can see the bottom of the tool. Notice the registration mark on the guide block and the body of the tool. This insides of the thread box with the guide block removed. The cutter comes in from the left. To adjust the thread box cutter first remove the guide block, shown in the upper picture above, by taking out the two screws that hold it to the thread box. Before removing the guide block I suggest that you put a mark on one end of the block, also shown in the upper picture above, and the thread box body. This ensures that you can replace the guide block in the same position, insuring the same alignment as when it was manufactured. cutter in, away from the threads, using something softer than the cutter such as a wood pencil. Replace the guide block and try the cut again. When re-starting the cut turn the thread box counter clockwise until you feel it drop down into the previous cut. Then begin the new cut. If the tool still binds stop the cut and go through the above adjustment procedure again. It may take several adjustments to get it right. That is why you use a scrap dowel for setup. You don’t want to ruin a good work piece. The external threads should turn freely into the internal threads, but not too loose. You need to allow for wood expansion if you are doing this in a dry season. The fit can be a little tighter if you are doing this in the humid season. The instructions that came with my AMT thread box sets gives recommendations for wood species to use. They recommend yellow birch, hickory, ash, poplar, cherry and walnut. The instructions also specify woods NOT recommended. These woods are hard maple, oak, paduak and rosewood. I have tapped red oak, but I would not try to use the thread box for external threads in this wood. I have also tried the thread box on hard maple. This resulted in a big chip in the thread box cutter. 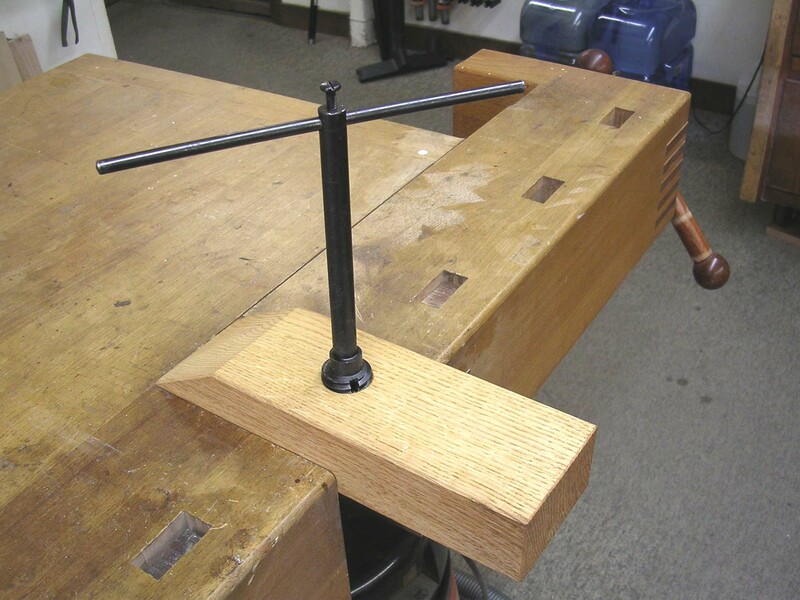 This is a parallel jaw vise I made using the thread box set. The modern thread box and tap sets do a very credible job of cutting both internal and external threads and they are a lot of fun to use. The list of possible projects is almost endless. I used my 1”-6TPI (threads per inch) set to make the parallel jaw vise pictured above. The jaws are red oak and were not bad to tap. The screws were made from walnut and the thread box did a very good job on them. If you are new to this blog I wrote an article on this vise a while back. It is a very handy and versatile tool. I use it very often. Look in the index if you are interested in this vise or LMK if you would like me to make one for you. Because of their wood species limitations the thread box would not work for me. My desire is to make quality wood screws and nuts for vises and the wood of choice is hard maple. To date I have tried two different methods of threading wood and neither produced the results I am looking for. In both methods the taps, though very different worked well. The problems each of these methods presented was with the external threads. For my next threading project I will mount a router to a vintage engine lathe. I know this setup will produce a near perfect male thread with perfect pitch in any species of wood. This will eliminate all of the previous problems. Because of the work involved I will go all the way on this project and develop a 90 degree thread profile. This will require that I make a tap because no taps are available for this profile. The 90 degree thread profile has long been accepted as the strongest thread profile for wood threads. My current workload means that this project is going to take a while. When finished I will publish the complete results here. This entry was posted in Product Reviews and tagged tap, thread box, vise, wood nuts, wood screws, wood threading. Bookmark the permalink. Do you turn the pins with handles yourself? If you want to tap a hard wood like maple without tear out try soaking it under water for a few days first. Your tip does work, however, a thread box is not the best way to thread wood and most thread boxes don’t recommend maple. The biggest problem with currently available thread boxes and taps is the thread form, 60 degrees. The 60 degree thread form was developed for metals it is what works best and has been the standard for nearly as long as I can remember. 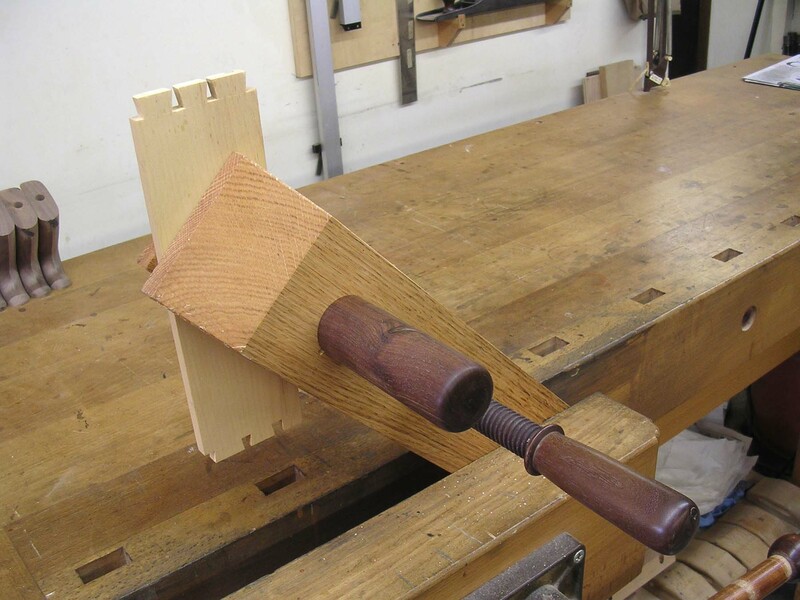 It has been shown that 90 degrees is a much better thread form for wood. To cut a 90 degree thread requires custom made tooling. A custom cutter for the thread box is not difficult, but for the internal threads you must make a tap. This is not impossible, but it is more work than I wish to do. Thank you for your comment. the information is appreciated. Thank you for this well done blog post. I took some really useful info from it. Thank you for the compliment and for reading my blog. I hope the information is some help to you. I have an AMT thread cutting set that appears the same as yours. I got it from my father in law and have yet to use it. After eyeballing the cutter setup in the thread box I felt it was not going to cut very well in hard wood, hence my internet search where I found your blog. Comment on design. How about cutting into the aluminum thread guide and box handle on the opposite side and using two cutter bits? That way each bit would only have to cut half of the thread imposing less of a load on each cutter. Would it behave the same as the internal thread cutter tap that has two cutting surfaces? Since the company is no longer in business, where can I purchase replacement cutter bits? You used to be able to get new bits at Woodcraft. The bits are difficult to resharpen and don’t stand up well. Adding a second one would help but it has to be precisely located for it to work properly. I am not a fan of cutting external threads with a thread box. Nice post about the biz of threading wood and the bit about the buisness not operating is sad, in our day this happens way to often. We find tools no longer being made but copies are around but some quality is always lost. I did the same with the pipe on the taper tap to add some torque in white oak, I knew better but the tap snapped. The one you discribe sounds like primo quality.